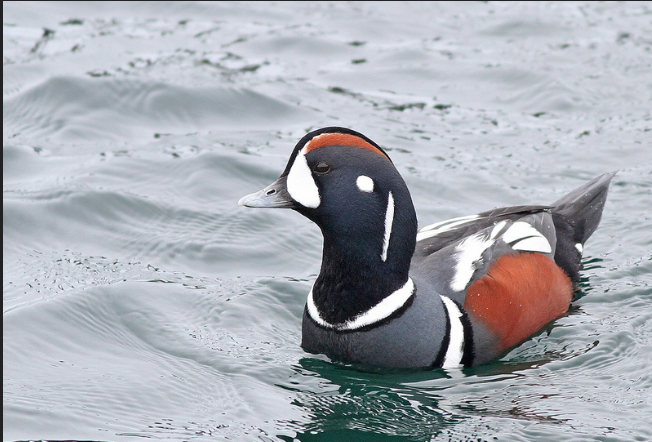 Harlequin Ducks and at least one Snowy Owl have arrived along the rockbound shore of “the other Cape,”so it’s time to sign up for the Sixth Annual Cape Ann Winter Birding Weekend: January 30 – February 1, 2015, sponsored by Mass Audubon and the Cape Ann Chamber of Commerce. and personal with these spectacular and fascinating creatures with Mark and Marcia Wilson; Osprey in Essex County – The Dramatic Comeback Story of This Magnificent Bird of Prey by Dave Rimmer of the Essex County Greenbelt Association – and of course The Sunday Boat Trip on Seven Seas Whalewatch boat, Privateer IV skippered by Jay Frontierro. As in past years, the venue is the Elks at Bass Rocks in Gloucester where you can bird in comfort from the picture windows, enjoy a variety of exhibits and try out the best birding optics on the planet, or step outside and scan the Atlantic for a King Eider. The space on the buses and boat is limited, so sign-up soon so you don’t miss the fun!